Sometimes the little shops in the hospital surprise me. After the dissolution of the snack foods where the powers that be decided that we shouldn't have fried crisps (but can have cholocate and flapjacks) we have gained some fringe oddities from smaller brands. This is especially true in the non main shops where they are less swayed by the whims of the management. 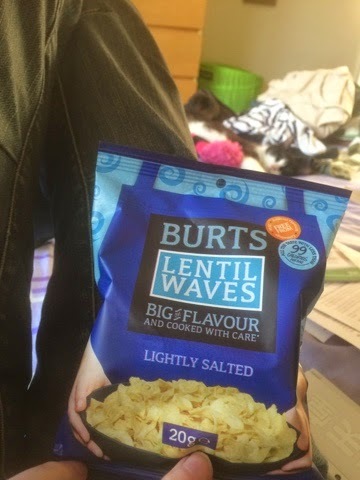 On one trip I spotted these lentil waves from Burt's that tickled my fancy. At 50p a bag they were more expensive than I'd usually go for, but as they counted as a review I could justify it. Turns out these are pretty nice. The waves themselves are essentially O shaped and would be flat but they have warped in the cooking process. 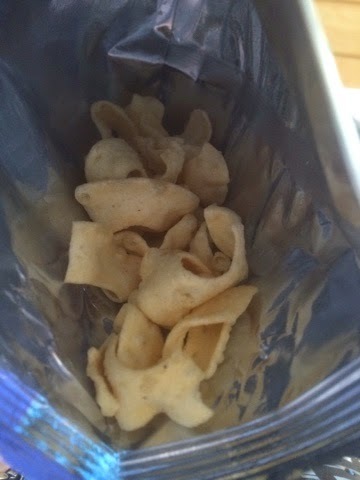 They are kind of like poppadoms and feel a lot more 'bad for you' than the bag suggests. We had a snack time with these one weekend and discovered that they are well worth a look if you do like the large Indian crisps that you get as starters. The flavour of the crisps themselves is really rich and deep but there wasn't much of a flavouring added. Lightly salted is right - I think these could do with a lot more! There are other flavours so I will continue to buy these.